He quit school at 16 to build fences in the Civilian Conservation Corps in Greenville, Illinois. While working on a fence, he was hit in the eye by a nail and sustained a severe injury. Despite limited vision in the injured eye, he continued to work, and he continued to play baseball at night and on weekends. When the Conservation Corps was disbanded, Mr. Schoendienst got a job as a supply clerk at Scott Field in Belleville, and he continued to play baseball. In 1942, at age 19, he hitchhiked to St. Louis for a tryout at Sportsman's Park and was signed into the Cardinals farm system. Three years later, the switch-hitter was on the Cardinals professional roster, playing shortstop, second base, third base and the outfield for several seasons. Red Schoendienst, Cardinal great, dies at 95. He was drafted into the U.S. Army and served for a year during World War II. His earlier eye injury and a shoulder injury earned him an early discharge. But his injuries did not prevent him from returning to the Cardinals in 1945 to beef up the roster, as his future teammate, roommate and fellow Hall of Famer, Stan Musial, was leaving for military service. With Musial back in the lineup in 1946, Mr. Schoendienst settled in at second base, helping the Cardinals win their third World Series title in four years. Those hands would earn him recognition as one half of the best double-play combinations in the league with shortstop Marty Marion. Over his career, he had 1,368 double plays and led the league in double plays in 1953 and 1954. He set a major-league record with eight doubles in three consecutive games. As a second baseman, he posted some impressive numbers: 4,616 putouts, 5,243 assists, 1,368 double plays and only 170 errors in 10,029 total chances, for a high .983 fielding average. Mr. Schoendienst spent all but four years of his playing career in St. Louis. In 1956, Mr. Schoendienst was traded from St. Louis to the New York Giants. In 1957, he went to the Milwaukee Braves midseason and led the Braves to their first pennant in nine years. They went on to beat the New York Yankees in the World Series. The following year, he was diagnosed with tuberculosis and had a portion of a lung removed, but by the fall of 1959, Mr. Schoendienst was with the Braves briefly before coming home to cap off a stellar career. He returned to St. Louis in 1960, becoming one of the team’s best hitters. During his final seasons, he hit more than .300 and ended his career in St. Louis with a .289 batting average. During 2216 games, he had 84 home runs, 773 runs batted in, 1,223 runs, 2,449 hits, 427 doubles, 78 triples and 89 stolen bases. He retired as a player in 1963, but he never left the game he loved. He quickly made a successful transition from the playing field to the manager’s office. 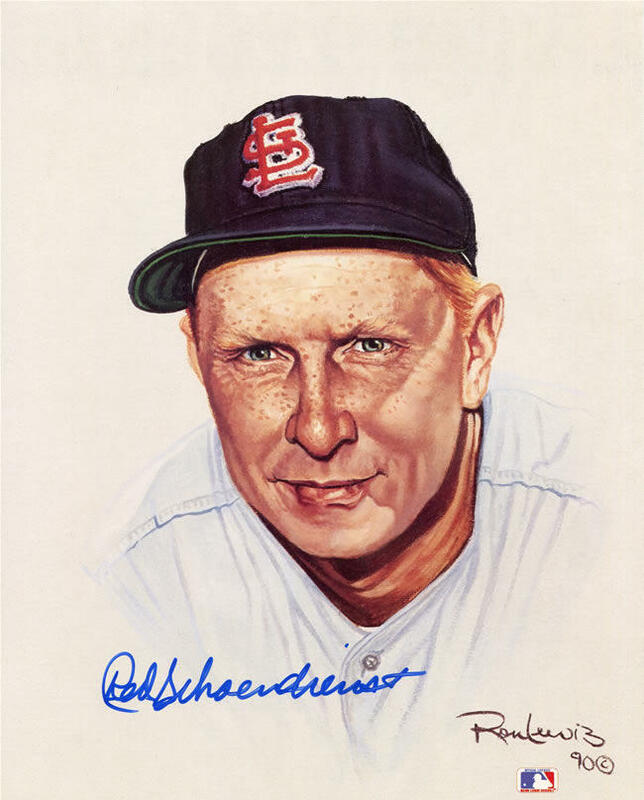 From 1965 to 1976, Mr. Schoendienst managed the Cardinals, the team where he began and ended his baseball-playing days. As a manager, he earned a reputation for treating players fairly and showing them respect, like when he encouraged a lonely Spanish-speaking player, Orlando Cepeda, whom he christenend “Cha-Cha,” to bring his music into the locker room. He was the second-longest-serving Cardinal manager, behind Tony La Russa. His managing record was 938-835, and he was 7-7 in World Series play. Mr. Schoendienst led the Cardinals to the National League pennant and a World Series win in 1967, defeating the Boston Red Sox in seven games. He again led the Cardinals to a National League pennant win in 1968. He was briefly lured away from St. Louis. But after coaching the 1977-78 Oakland Athletics, he returned to the Cardinals as a coach, acting manager and special assistant to the general manager. He would not leave again. In the spring of 2010, Mr. Schoendienst was where he was almost every spring for more than 60 years: at Spring Training. He was in full Cardinal uniform, working shoulder to shoulder with Tony La Russa in Jupiter, Florida. He told the Post-Dispatch what he was doing there. Mr. Schoendienst, who played on five World Series championship teams, was selected to play in ten All-Star games; in 1950, he stunned the American League with a game-winning pinch-hit home run in the 14th inning of the All-Star Game. He was elected to the Baseball Hall of Fame in 1989. A statue of Mr. Schoendienst sits outside new Busch Stadium, just as it did at old Busch Stadium, near the statue of his best friend for almost 70 years, Stan Musial, who died January 19, 2013, one day after he celebrated his 90th birthday – where else? – at Mike Shannon’s Steaks and Seafood Restaurant. He threw out the ceremonial first pitch to then-Cardinal first baseman Albert Pujols before the Opening Day game against the Pittsburgh Pirates on April 6, 2009, at Busch Stadium. Three months later, on July 14, he was on hand for the All-Star game, where President Barack Obama threw out the first pitch. The Cardinals retired jersey No. 2 on May 11, 1996, “Red Schoendienst Day.” His autobiography, "Red: A Baseball Life," with Rob Rains, with a foreword by Musial, was published in 1998, the same year he got his star on the St. Louis Walk of Fame in the University City Loop. Mr. Schoendienst did his share of community service. He participated in the Mike Bush Fantasy Baseball Camp, which teaches hearing-impaired children how to play baseball, and Cardinals Care, the team’s charitable arm for children. He served as co-chair of Catholic Charities’ annual fund drive in 1989 and often played in charitable golf tournaments. He was once co-owner of Mari de Villa Retirement Community with the late Joe Linneman, his boyhood friend who signed with the Cardinals at the same time that Mr. Schoendienst did. He later served on the retirement home’s board. Mr. Schoendienst was married for 53 years to Mary Eileen, his biggest supporter, who died in 1999. She once negotiated him a salary increase with the Cardinals. He is survived by four children: Colleen Schoendienst, Kevin Schoendienst, Eileen Schless and Cathleen Schoendienst, and brothers (Joe and Elmer, both former baseball players) and 10 grandchildren. Correction: An earlier version of this story gave the incorrect first name for Mr. Schoendienst. His name is Albert Fred Schoendienst. The Cardinals will be seeing Red tonight, as they honor their beloved No. 2. A tribute to Hall of Famer Red Schoendienst will be held at 7 p.m. before the game — the 70th anniversary of his first major league appearance — and will continue throughout the season with a social media campaign.